Author of Solitude: A Singular Life in a Crowded World and The End of Absence: Reclaiming What We've Lost in an Age of Constant Connection. Turning, one evening, from my phone to a book, I set myself the task of reading a single chapter in one sitting. Simple. But I couldn't. There was nothing wrong with my eyes. No stroke or disease clouded my way. Yet – if I'm being honest – the failure was also not a surprise. Out for dinner with another writer, I said, "I think I've forgotten how to read." "Yes!" he replied, pointing his knife. "Everybody has." "No, really," I said. "I mean I actually can't do it any more." He nodded: "Nobody can read like they used to. But nobody wants to talk about it." For good reason. It's embarrassing. Especially for someone like me. I'm supposed to be an author – words are kind of my job. Without reading, I'm not sure who I am. So, it's been unnerving to realize: I have forgotten how to read – really read – and I've been refusing to talk about it out of pride. Books were once my refuge. To be in bed with a Highsmith novel was a salve. To read was to disappear, become enrobed in something beyond my own jittery ego. To read was to shutter myself and, in so doing, discover a larger experience. I do think old, book-oriented styles of reading opened the world to me – by closing it. And new, screen-oriented styles of reading seem to have the opposite effect: They close the world to me, by opening it. In a very real way, to lose old styles of reading is to lose a part of ourselves. For most of modern life, printed matter was, as the media critic Neil Postman put it, "the model, the metaphor, and the measure of all discourse." The resonance of printed books – their lineal structure, the demands they make on our attention – touches every corner of the world we've inherited. But online life makes me into a different kind of reader – a cynical one. I scrounge, now, for the useful fact; I zero in on the shareable link. My attention – and thus my experience – fractures. Online reading is about clicks, and comments, and points. When I take that mindset and try to apply it to a beaten-up paperback, my mind bucks. Author Nicholas Carr ( The Shallows) writes that, "digital technologies are training us to be more conscious of and more antagonistic toward delays of all sorts." We become, "more intolerant of moments of time that pass without the arrival of new stimuli." So, I throw down the old book, craving mental Tabasco sauce. And yet not every emotion can be reduced to an emoji, and not every thought can be conveyed via tweet. Even Eric Schmidt, the erstwhile chief executive of Google, was anxious about the mental landscape he was helping to cultivate. He once told Charlie Rose: "I worry that the level of interrupt, the sort of overwhelming rapidity of information … is in fact affecting cognition. It is affecting deeper thinking. I still believe that sitting down and reading a book is the best way to really learn something. And I worry that we're losing that." In fact, there's a great deal of reporting now – from neuroscientists such as Susan Greenfield and Gary Small – to show that digital native brains do engage in concretely different ways from those of previous generations. Spend 10 hours a day staring at screens and – yes – your synapses will adapt. For a long time, I convinced myself that a childhood spent immersed in old-fashioned books would insulate me somehow from our new media climate – that I could keep on reading and writing in the old way because my mind was formed in pre-internet days. But the mind is plastic – and I have changed. I'm not the reader I was. When we become cynical readers – when we read in the disjointed, goal-oriented way that online life encourages – we stop exercising our attention. We stop reading with a sense of faith that some larger purpose may be served. This doesn't mean we're reading less – not at all. In fact, we live in a text-gorged society in which the most fleeting thought is a thumb-dash away from posterity. What's at stake is not whether we read. It's how we read. And that's something we'll have to each judge for ourselves; it can't be tallied by Statistics Canada. For myself: I know I'm not reading less, but I also know I'm reading worse. It's no wonder why. Spend your life flashing between points of transitory data and a dog-eared novel begins to feel interminable. Our sense of time has always been warped by our technologies. Church bells segmented the day into intervals. Factory whistles ushered workers. But the current barrage of alerts and pings leaves us more warped than ever. I've been trained not just to expect disruption, but to demand it. Back in 1890, William James wrote in The Principles of Psychology that "our sense of time seems subject to the law of contrast." No kidding. Marshall McLuhan believed that every technology "has the power to numb human awareness during the period of its first interiorization." And it seems we have digested our devices; they can numb us, now, to the pleasure of patience. They can numb our enjoyment of that older literary experience. The other day, I was spending time with a young niece – still a toddler – while she watched videos on her iPad. She was working her way through a YouTube playlist – in each video, a pair of hands opened a Kinder Surprise and assembled the toy inside. Thinking I was doing her a favour, I made the video full-screen. But this sent my niece into a panic. "Little TV!" she insisted. "Not big TV!" She needed the smaller screen format so as to monitor the lineup of videos still to come. Focusing, even for a minute, on a single video was no good. She needed the panoply, the stream, the comfort of attending entertainments. The suggestion that, in a few generations, our experience of media will be reinvented shouldn't surprise us. We should, instead, marvel at the fact we ever read books at all. Great researchers such as Maryanne Wolf and Alison Gopnik remind us that the human brain was never designed to read. Rather, elements of the visual cortex – which evolved for other purposes – were hijacked in order to pull off the trick. The deep reading that a novel demands doesn't come easy and it was never "natural." Our default state is, if anything, one of distractedness. The gaze shifts, the attention flits; we scour the environment for clues. (Otherwise, that predator in the shadows might eat us.) How primed are we for distraction? One famous study found humans would rather give themselves electric shocks than sit alone with their thoughts for 10 minutes. We disobey those instincts every time we get lost in a book. Literacy has only been common (outside the elite) since the 19th century. And it's hardly been crystallized since then. 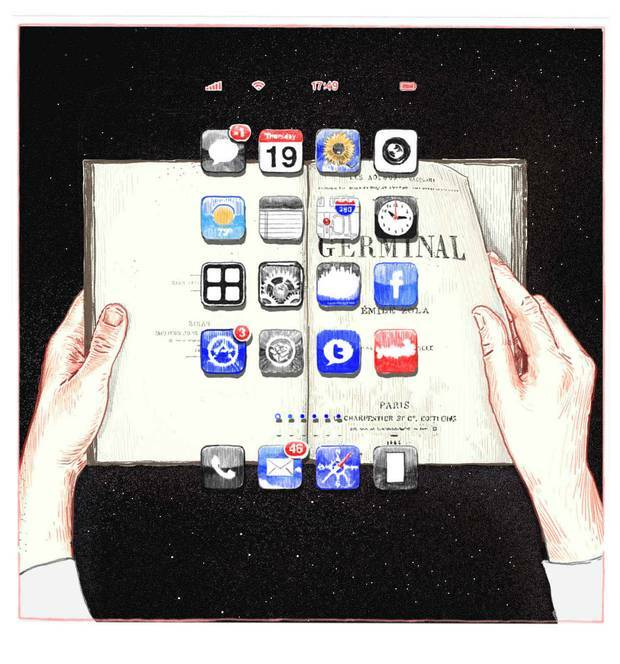 Our habits of reading could easily become antiquated. The writer Clay Shirky even suggests that we've lately been "emptily praising" Tolstoy and Proust. Those old, solitary experiences with literature were "just a side-effect of living in an environment of impoverished access." In our online world, we can move on. And our brains – only temporarily hijacked by books – will now be hijacked by whatever comes next. Victor Hugo once wrote that the book replaced architecture as "the great handwriting of the human race." Is it so unreasonable to assume that our "great handwriting" will be scrawled by some other means tomorrow? How could it not? What we'll have to look out for is how cynical – how efficient and ruthlessly algorithmic – that next thing is going to be. "A book," one author told me, "is really just a reverse-engineered TED Talk, right? It's a platform that lets you do a speaking tour." For many writers, this is the new wisdom. A cynical style of reading gives way to a cynical style of writing. I've watched my own books become "useful" as they made their way into public conversation. I never meant them to be useful – in a self-help sense – but that was how they were often read. I say this with less reproach than surprise: Almost every interviewer has asked me for tips and practical life advice, despite the fact my books offer neither. Meanwhile, I admit it: The words I write now filter through a new set of criteria. Do they grab; do they anger? Can this be read without care? Are the sentences brief enough? And the thoughts? It's tempting to let myself become so cynical a writer because I'm already such a cynical reader. I am giving what I get. In Silicon Valley, they have a saying that explains why an algorithm starts producing unwanted results: Garbage in, garbage out. The idea is that an algorithm can only work with the information you feed it. Aren't writers – all creators – algorithmic in that way? Our job is to process what we consume. Beauty in, beauty out. Garbage in, garbage out. So maybe that change into a cynical writer can be forestalled – if I can first correct my reading diet, remember how to read the way I once did. Not scan, not share, not excerpt – but read. Patiently, slowly, uselessly.